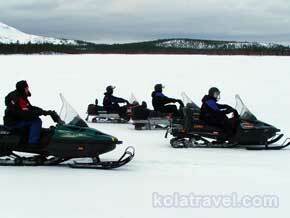 For experienced snowmobilers we offer a more than 600 km long Polar Snowmobile Adventure through the wilderness of Kola Peninsula. 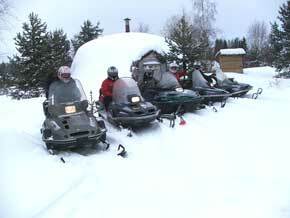 You will visit places and remote villages which are only reachable in winter by snowmobiles and reindeers with sledges. The landscape in the centre of Kola Peninsula is magnificent beautiful with different kind of forests, frozen lakes and rivers, tundra's with huge panorama's and exciting driving. We will use as much as possible tracks used by the original Reindeer People "Saami". That means also deep snow driving, sometimes to be patient and to improvise. 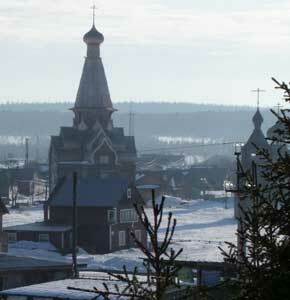 The track goes from Oktyabrsky to Lappish village Krasnoschelye followed by Varzuga with the beautiful wooden Uspenskaya Church dated from 1674 and to Umba fishing village on the White Sea. 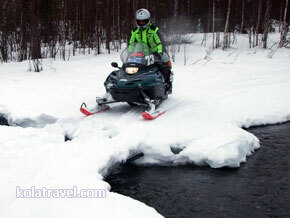 From Umba we drive northwards to Inga where we overnight in a Saami Sot house and back to Oktyabrsky. Everyday you can enjoy the hot Russian Banya (sauna) and traditional meals of local people. Lunches will be in the open air around campfires. Read more details in the itinerary below. • Excursion in the first Nuclear Icebreaker LENIN. • Visit to the Northern Navy Museum. • Seal performance in Murmansk Oceanarium. • 2 nights in twin rooms in the lumberjack guest house Yolki-Palki (dry toilets and washing room on the first floor. Sauna outside). 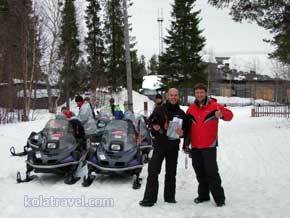 • 1 night in a guest house in Krasnoschelye village: twin and triple rooms. (Dry toilet and sauna outside). • 1 night in the Lappish Dwelling: sleeping places on a half-round wooden bench on reindeer fur. (Dry toilet and sauna outside). • 1 night in twin rooms in a guest house in Umba village (toilet on the first floor. Sauna outside). • 1 night in a guest house in Varzuga village. (Dry toilet and sauna are outside). • Food: full board from Day 2 to Day 6, dinner at Day 1, breakfast at Day 7. • Sleeping bag suitable for winter, sun glasses.